The editing of Chaucer’s Canterbury Tales in the form in which we now read it took many decades of work by a number of different scholars, but there is as yet no readily available edition that takes account of all the different versions in which the Canterbury Tales survives. Some of this is purely pragmatic. There are over 80 surviving manuscripts from before 1500 containing all or some parts of the Tales (55 of these are complete texts or were meant to be). The great Oxford edition of the nineteenth century, by Walter William Skeat, relies mostly on a single manuscript (‘Ellesmere’) with corrections from only six other texts. The edition in which most people have read the Tales in recent decades, the Riverside Chaucer (also printed in the UK by Oxford), also relies on Ellesmere, although it consults many more manuscripts than six to establish its base text. This is also Jill Mann’s practice in the recent Penguin edition of the Tales. But what if someone wanted to edit Chaucer from all the manuscripts, accounting carefully for all the variations? What if a student simply wanted to get some sense of what sorts of variation were possible in a manuscript culture, where every copy of a text was different because every such copy had to be hand-written? The difference consists of the spelling ‘bokes’ in place of ‘bookes’, and the insertion (this would have been Skeat’s editorial decision) of a comma. More important than the nature or size (or consequence) of this difference, however, is the way that the print technology that has determined how we read Chaucer for so long must always tend toward Skeat’s simplicity. Mann’s Penguin edition, the most user-friendly we now have — and therefore destined to be the most read in future years — does not include variants at all. The Riverside Chaucer includes some variants in its ‘Textual Notes’ but it moves all of these to the back of the book. Complicate things as much as Manly and Rickert did with all the variants, and no one will read your text. Online editions open out new possibilities for marrying simplicity to completeness. One can imagine a hypertext edition in which all the variants associated with a particular word, phrase, or line, would simply appear as a cursor passed over the text (much as the contents of a footnote will appear in a bubble when the cursor moves across the reference in a text written in Word). The paradox seems stark: only when the words of the text are lifted entirely away from any page can the complexity of the page be fully preserved and disseminated. And yet it is not a paradox if we think of such a hypertext as finally overcoming the limits of print technology. No longer shackled by the limits of mechanical reproduction, the digital age gives us a text that, precisely because it lacks physical form is supple enough to represent the complexity of that form. Such a hypertext is not yet with us because entering the variants in the marked-up form that would make them available in this way is itself a huge undertaking (digital technology is never more powerful than the information human labor can provide for it). But an online edition such as Oxford’s is already sufficient to the task of making the complex simple in all the ways that a medieval text with many variants requires. If books must separate variants from the text of the Tales in precise proportion to their detail (include many and they must be placed at the back of the book; include all of them and you need several more books), but simply give yourself the virtual page in which an infinite amount of information may un-scroll in one column while the text sits happily, unmoved, in another, and all the variants of a text can accompany every word and phrase and line of that text at all times. Such an edition can also put the complexity of these variants in the hand of everyone — student and scholar alike — who has a computer and an internet connection. Many libraries own neither Manly-Rickert nor Skeat. And even the copyright library in which I write these remarks, the Cambridge University Library, requires that the volumes of Manly-Rickert be fetched to its ‘West Room’, but keeps Skeat in its Rare Books Room (because it was published before 1900). To bring Manly-Rickert’s variants to Skeat’s text they must be couriered by a member of staff (a reader cannot transport them from West to Rare Books Room himself). Since neither set of volumes circulates I could not bring them home to compare with my own copies of the Riverside and Mann’s Penguin edition. These common editions should have been available on the open shelves (and I could have found them there and brought them to the Rare Books room myself) but, as it happened, on the day I was gathering these volumes together, the Penguin edition of the Tales was checked out. None of these movements is anything more than tedious, and careful scholarship moves greater mountains of inconvenience very day. And yet these are obstacles that might well defeat the undergraduate or post-graduate who simply wanted to explore what variation might exist in the text of the Tales. And a scholar focused on the variants in the text of the Tales might more easily go beyond those variants (to thoughts about the patterns they display; to theories about the nature or reliability of the edited text itself) if it was easier to consult them. What everybody who reads the Canterbury Tales has lacked up until this point, in other words, is a way of accessing all the richness of the material form in which the Tales survives as a constant and necessary concomitant of a readable text. The representational power of digital technology enriches the works we have long known and loved by just such elaborations. Christopher Cannon is a Professor of English at New York University and member of the Oxford Scholarly Editions Online editorial board. He teaches Middle English literature at New York University. He took his BA, MA and PhD at Harvard University, and then taught, successively, at UCLA, Oxford, and Cambridge. His PhD dissertation and first book, The Making of Chaucer’s English (1998) analyzed the origins of Chaucer’s vocabulary and style using an extensive database and purpose-built software to demonstrate that Chaucer owed much more to earlier English writers than had been recognized before. His second book, on early Middle English, The Grounds of English Literature (2004), developed these discoveries by means of a new theory of literary form. Most recently he has written a cultural history of Middle English. Oxford Scholarly Editions Online is coming soon. To discover more about it, view this series of videos about the launch of the project or read a series of blog posts on the OUPblog. 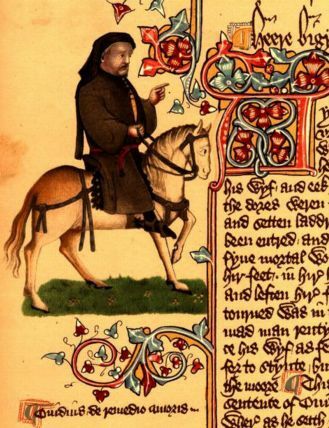 Image credit: Image of Chaucer as a pilgrim from Ellesmere Manuscript in the Huntington Library in San Marino, California. The manuscript is an early publishing of the Canterbury Tales. Source: Wikimedia Commons. As an aside, the Skeat is available free at the Internet Archive. Of course the OCR text is not trustworthy, but the scanned page images are as good as a physical book.